The Chinese regime has achieved a critical breakthrough in its aircraft carrier program by incorporating key technology from a British company it discretely acquired a decade ago. The acquisition was not hindered by British regulators at the time, although the key semiconductor device in question has been specifically listed as subject to export control by European Union regulations. At stake is China’s ability to compete directly with U.S. carrier power by being able to launch heavier and more powerful aircraft. China and the United States have engaged in a relentless race to develop the next generation electromagnetic aircraft launch system (EMALS) for over a decade, and up until recently, it was thought that the United States led the race with the upcoming Ford-class aircraft carrier, which has been specifically designed to use electromagnetic-powered catapults. Recent reports indicate that China may have caught up with U.S. progress, as the People’s Liberation Army newspaper published a story in October claiming that a successful test launch of navy aircraft has been achieved using an “experimental launch system.” The French website East Pendulum, which monitors Asian and particularly Chinese military developments, also reported that satellite images and publicly released photos of the test sites corroborate the existence of these tests. While the development of EMALS in both the United States and China has remained highly classified, it is believed that building such a system requires a critical semiconductor component called an insulated-gate bipolar transistor (IGBT) chip. The chip can switch the electrical current to the windings of the motor in milliseconds to enable the launching of aircraft from the carrier flight deck. China’s breakthrough in EMALS is due in no small part to the fact that it can now produce its own IGBT chips with the required specifications, according to an article by the Hong Kong-based South China Morning Post. The same article says that China secured the critical IGBT technology it needed by acquiring Dynex Semiconductor, a relatively small British semiconductor company that sold 75 percent of its share to Zhuzhou CSR Times Electric, a Chinese state-owned enterprise. The acquisition, which took place in 2008 in the aftermath of the global financial crisis, was allowed to go through by the Gordon Brown government, which did not see it as a national security threat, an unnamed source within the current UK government told The Epoch Times. IGBT has been listed under category III of the UK Strategic Export Control Lists since 2009, as part of EU Council Regulation 428/2009. A good listed under this category is determined to have “strategic” purposes and therefore requires an export license to be sent outside of the United Kingdom. Dynex Semiconductor has declined repeated requests for comment. At stake is China’s ability to compete directly with U.S. carrier power by being able to launch heavier and more powerful aircraft. The role of Dynex’s acquisition in helping China’s EMALS program has been discussed for some time by a number of Chinese sources. Gong Jianghui, an associate professor at the Beijing Normal University and a bestselling writer in China under the pen name Qi Cheng, fictionalized the event in his 2014 novel, “Material Empire.” In the novel, he portrays the acquisition of Dynex and its critical IGBT production tools as essentially being a premeditated “operation” by China to grab critical military technology from a small and faltering Western company. Jayant Baliga, a professor at North Carolina State University who is well-known for being the inventor of the IGBT device in 1979, explains that the bulk of manufacturing of the device has moved outside of the United States to Japan and Europe. This followed the U.S. government’s decision in the late 1980s to favor the research of a competing device, which did not become successful. China’s surprise breakthrough in electromagnetic aircraft launch systems represents “a tragedy for the United States,” said Richard Fisher, a senior fellow at the International Assessment and Strategy Center. “[The United States] had been planning on achieving early breakthroughs that would help sustain U.S. military superiority. China’s extensive investments in electromagnetic launch and laser weapon systems may very likely reduce this period of U.S. superiority,” said Fisher. 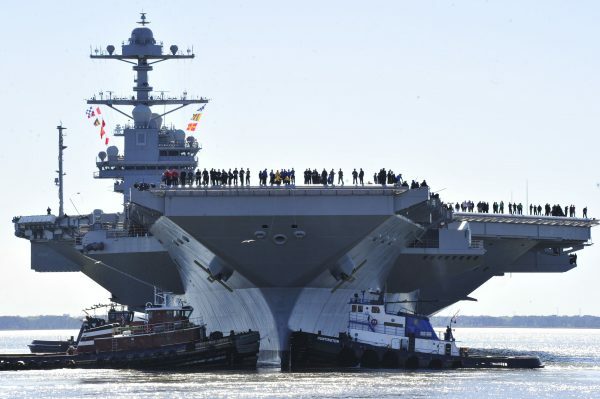 The U.S. Navy currently operates 10 Nimitz class aircraft carriers that rely on the decades-old but powerful steam catapult design to launch aircraft, enabling the Navy to project power around the globe. China’s People’s Liberation Army Navy, on the other hand, operates two smaller carriers based on a design from the former Soviet Union that can only launch aircraft from a ski-jump ramp, which is far less efficient and imposes performance constraints on the Chinese carrier aircraft. China’s two existing carriers, the Liaoning and Type 001A, both carry Shenyang J-15 fighter jets, which are based on the Russian-designed Sukhoi Su-33. The ski-jump design on both ships reduces the number of aircraft that can be launched simultaneously. Even more importantly, the design imposes a limit on the takeoff weight of J-15 fighters, as every successful takeoff will require some level of tradeoff between armaments or fuel, or both. 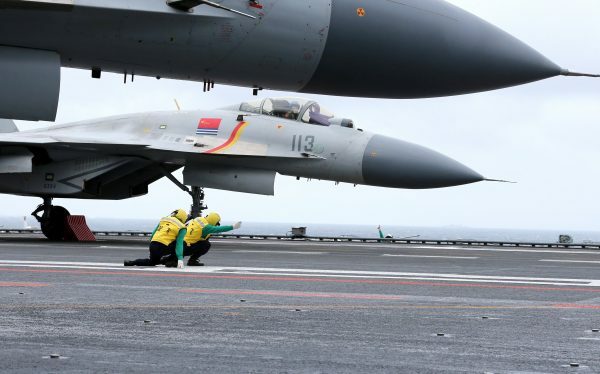 The Chinese regime has leapfrogged the current steam catapult technology used by the U.S. Navy by investing heavily in developing the next generation EMALS, which requires less maintenance and space while offering higher efficiency in launching and landing aircraft. 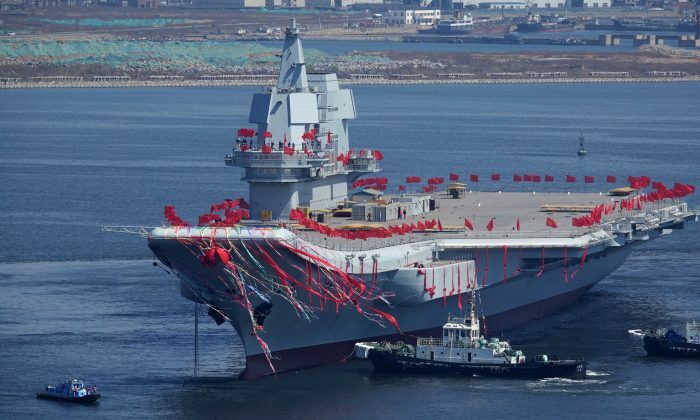 While the outdated design of both the Liaoning and Type 001A carriers means that they are unlikely to be retrofitted with the advanced EMALS, which requires a sophisticated power source, Richard Fisher said that successful development of EMALS would allow China to put it on its future nuclear-powered aircraft carriers and make them potentially as effective as the latest U.S. Ford class, accelerating the PLA’s drive toward global power projection. China is believed to be planning to construct at least two and as many as 10 additional nuclear-powered aircraft carriers by 2049—the centenary of the founding of the People’s Republic of China, according to an estimate by the defense studies website Global Security. One of them, the Type 002, is already under construction at a shipyard outside Shanghai and has reached 90 percent completion, according to reports in November. The Chinese regime makes no secret that its ambitious aircraft carrier program is aimed at building the capabilities to deter the U.S. military from intervening in the Asia-Pacific region during a crisis or conflict, according to U.S. Department of Defense’s 2017 annual report to Congress. Such crisis or conflict includes the scenario of a “Taiwan contingency,” an attack or invasion of Taiwan by China, or other military conflict against the United States or U.S. allies in the East or South China seas.